For years the word 'Peshwa' was synonymous with Pune, or Poona as the British called it. The association still persists to a degree. The Peshwas, after all, ruled Maharashtra from Pune for more than a century until 1818. The raison d’être of a town or city can be traced to its origins. Pune supposedly began with the Bhonsles of Shivaji fame, the Peshwas then followed on their heels, and finally the British made their mark until 1947. Each added their own layer to Pune's history and what we get is a palimpsest: nothing is completely erased; remnants of the old are still visible. But Pune has forged ahead, metamorphosing into a host of raisons d’être: the defence establishments of the Southern Command, laboratories and scientific research institutes, hospitals, colleges and a major university, computer training schools and cyber cafés, technical vocational institutes, art schools and cultural organizations, theatres, museums, plazas and shopping malls, booksellers, publishers, printing presses, heavy industries, a stock exchange, national and international banks, head offices of domestic and multinational companies, hotels, restaurants and boarding houses, a red light district. The list goes on. If Pune is viewed as a microcosm of planet earth, the modern, high-tech face of the upper and middle classes forms the crust, the prevailing Maratha culture the mantle, and the Brahmins descended from the Peshwas the core. Migrants form the fourth, atmospheric layer that gives the city a kind of buoyancy. They have come here from virtually every corner of India; they’ve changed Pune’s face and vitalized it. And earlier, progressive reformers like Phule, Agarkar, Gokhale and Karve shaped Pune’s distinctive social ethos. Marathi may be the city's mother tongue, but it is the migrants’ ethnic mix—Parsees, Christians, Jews, Muslims, Gujaratis, South Indians, Bengalis, Punjabis, Sindhis and rural folk from the Hindi belt, to name just some of the groups—that has enriched the city beyond measure, giving it a warmth and vibrancy, even a certain cosmopolitan feel. These diverse communities have thrown up a riotous variety we can all celebrate. Their social worlds, colliding and intersecting, each different from the other, give Pune its colorful character. Each community merged with the others until their tentacles spread and reached into every available piece of land that could conceivably be settled. And so Pune often seems like an overgrown village; it still retains an old-world sort of charm, beating to a gentler rhythm. Despite this, and despite some indolent ways it has inherited, Pune is on the whole a reasonably disciplined and industrious city. It is undoubtedly on the move, ready to join the global village. Software firms, computer vendors, computer institutes and net cafés have mushroomed, and generally set the mood and tone of the city. The Information Technology Park at Hinjewadi boasts leading IT firms like Infosys and Wipro. They seem eager to equip Pune for the 21st century. This is the cyber-veneer Pune has recently acquired. Who knows where the cyber-revolution will take this city, but it is changing a lot of people's lives. Pune seems poised to become another Cyberabad. Mumbaikars have always regarded Pune as a satellite town, a refuge for those weary of Mumbai's frenetic pace. For the British Pune served as a retreat from the burdens of the Bombay Presidency. But now, as Mumbai's growth slows down, they're eagerly gravitating, if not flocking in droves, to this satellite, cashing in on the windfall profits made from the sale of golden real estate in that port city, and driving up prices here. Even Pune's gravitational center of employment has shifted to the twin, newly incorporated municipality of Pimpri-Chinchwad, formerly village suburbs bordering on the vast plots of the Maharashtra Industrial Development Corporation. Because of the natural flow of people from Bombay, the rich ethnic variety of Pune may appear to mimic that of Mumbai. Pune draws much strength also from its hinterland, from rural folk who've migrated to the urban cluster it represents. Most Puneites have roots outside, in a small town or village somewhere in Maharashtra. Is it surprising, then, that it resembles an overgrown village? In a city like Pune the line between tribal and townsman, rural and urban is often blurred. The civic idea is a superimposed one that has to be learned. But a psychological urbanization has been going on; former villagers who visit their native places find themselves out of step: they can neither slow down, nor can they see clearly the beauty of nature around them. Some ironies are cruel: the 'prosperity' of Indian cities is often a symbol of what they've taken away from their rural cousins; how they've enriched themselves at the expense of the rural dweller. The gulf between them is wide; wider, perhaps, than that between East and West. Instead of a master plan for the city, Pune has independent, and mostly private, planned developments under various rubrics, commercial or residential. 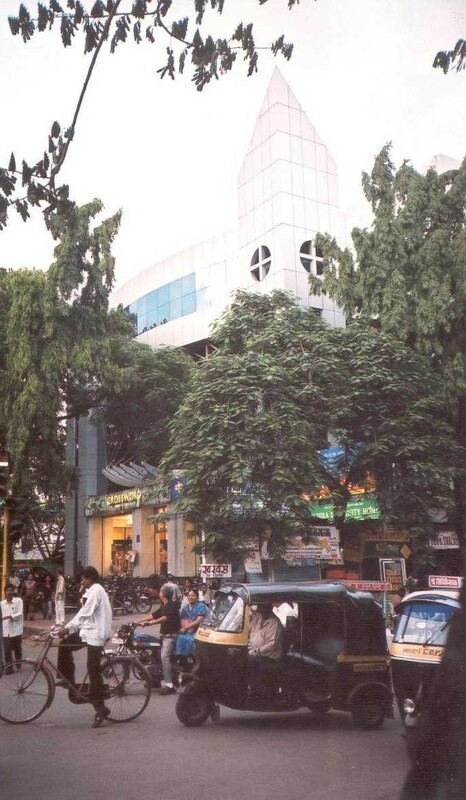 Kothrud was at one time reportedly the fastest growing suburb in the world. It used to be a village on the outskirts, as was Bhamburda before it became Shivaji Nagar. Aundh has become an ‘edge city’. To add to this bustle are many other burgeoning colonies and suburbs, some far from the main city which may be characterized by the triptych formed by the Deccan Gymkhana, the Gaothan (the original, or old city) and the Cantonment. In the Gaothan area, Shaniwar Wada stands like a dark stone colossus. It used to be the residence of the Peshwas during the 18th century, but functioned also as a fortification to deal with enemies and invaders. An impressive structure, it got destroyed before the Peshwas were finally ousted. What we see today are its remains. The Archaeological Society of India had for many years kept the enclosed space off limits, but now it features a Sound-N-Light show like the one at Delhi's Red Fort. It has also been the venue for some cultural programs. A 'Pune Center of Arts and Culture' housed within the Wada's ramparts seems possible—it would have an art gallery to exhibit sculpture, painting and photography; a stage or concert hall for music and dance; theatres for plays and movies, perhaps a museum, cafés and restaurants. There could also be rooms for music and drama rehearsals, a public library, bookshops, and the like. Yet, arguably, such a plan might be at odds with Pune's reticent character and the diffuse nature of its cultural life. Central squares and monuments are not its style, though in the past crowds would gather around Shaniwar Wada to hear politicians make grand rhetorical speeches. The Wada is already beginning to play such a role once again. Indeed, the space inside has recently become a venue for all sorts of cultural programs. Pune is culturally alive. Small, private music schools are legion. The annual Sawai Gandharva Music Fest has become a mecca, drawing veteran musicians and fans from all over India; new talent is also presented. Classical singers like Bhimsen Joshi got their start at the august Bharat Gayan Samaj. The Arya Sangeet Prasarak Mandal, which hosts the annual Music Fest, now has its own lavish Sawai Gandharva Cultural Center on University Road, across from the Police Ground. Pune’s Ganesh Festival now draws devotees from all over Maharashtra and beyond. As does the annual pilgrimmage of thousands of warkaris, spiritual followers of the great Bhakti Poets, Tukaram and Jnaneshwar, which wends its way from their respective birthplaces, Dehu and Alandi, to Pandharpur, passing through Pune soon after the monsoons begin. An enduring tradition. The theatre has always been Pune’s forte. Leading playwrights like Satish Alekar are a symbol of Pune’s prominent role in staging new and old works, and cultivating audiences. Small presses churn out myriad titles. Marathi publishers based here serve major and minor writers throughout the state, including Mumbai. Readings by authors and talks by scholars are an ongoing feature. Book exhibitions flourish, as do exhibits of visual art. In spite of these virtues Pune heaves under its burden and strains at the seams, trying to function without bursting and spilling its contents. In its outer aspect, Pune is much like any big, troubled urban settlement in India's interior, away from the four big metros that form a diamond on the map. Where the medieval and the modern live cheek by jowl. Slums and shantytowns are an obvious symptom of groups and communities on the move, in search of a livelihood—they defy town planning. They grow like barnacles. Pune owes its galloping spread to these shantytowns, which sport an urban face. But behind this face, the city festers, shudders, and occasionally explodes. The urban sprawl is unavoidable, as is unchecked growth that has added new life to the city and the trappings of modern life. The blandishments of American or European culture are everywhere present. Offices of multinational companies assert their slick presence. And contradictions abound. Witness architecture that’s out of tune with its drab surroundings: imitation Grecian-Roman pillars and arches, imported theme-park ideas, hotels done up as baroque palaces. Numerous old wadas have been razed to make way for multi-storied cement and concrete buildings in the cramped, congested Gaothan. Where trees have been cut, streets widened, and flyovers built, the coziness and intimacy of small shops, stores and homes has been lost. Today garish signs, company billboards, hawkers, illegal encroachments, crippling traffic, air and noise pollution have uglified the city. They signify a people’s exuberance after years of privation. Pune is considered the Queen of the Deccan. Blessed with a magnificent physical setting that reminds me of the American southwest. But can its inhabitants and their civic works match the grandeur of the landscape? Two years ago the maverick municipal commissioner, Arun Bhatia had the support of a large section of Pune’s citizenry, but his reforming mission was foiled by the corporators. To make a great city, as Bhatia demonstrated, takes not just grand sentiments, but worthy deeds. To my mind, Pune is neither an urban 'horror' nor a 'wonder'. It is an interesting amalgam of village, town and city all rolled into one, but expressing the spirit of each.